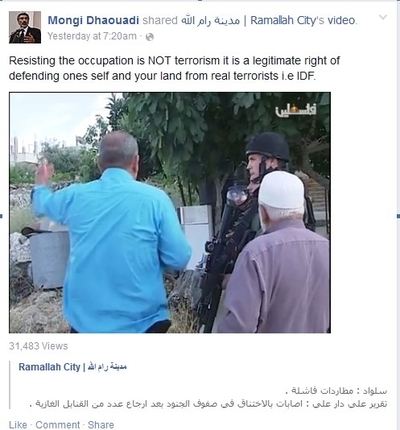 A board member with the Council on American Islamic Relations' (CAIR) Connecticut chapter reposted a video by a designated al-Qaida terrorist on his Facebook page last month and says Palestinian attacks against Israel aren't terrorist acts. Nonetheless, U.S. Sen. Richard Blumenthal, D-Conn., considers Mongi Dhaouadi his go-to guy on Muslim issues and has worked with him closely for the past six years. This relationship is particularly curious considering Blumenthal's strong statements of support for Israel. Dhaouadi is a man of contradictions. On one hand, he says that Islam and terror do not mix. "These terrorist groups don't represent our faith, do not represent our community. And so we want to make that clear to everyone who keeps saying that we don't hear enough from the Muslim community. We say it and we say it over and over again," Dhaouadi said in November 2015. 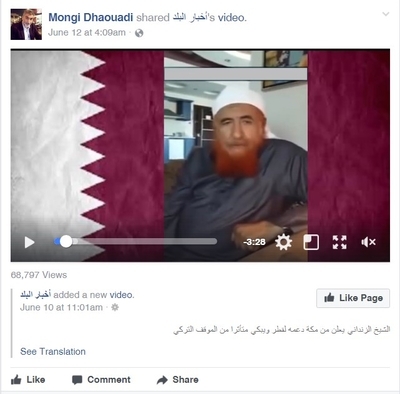 On the other, Dhaouadi reposted a pro-Qatar video on his Facebook page last month by Abdul Majeed Al-Zindani, a specially designated terrorist and former Osama bin Laden loyalist. A 2004 Treasury Department statement calls Al-Zindani one of bin Laden's "spiritual leaders." He also helped buy arms for al-Qaida and other terrorists. Al-Zindani also appears on the United Nations list of specially designated terrorists. He also served on the board of Sheikh Yusuf Qaradawi's Hamas-funding operation known as the Union of Good, the Treasury Department said in a 2008 press release labeling it a terrorist operation. Al-Zindani's al-Qaida connection persists; the Treasury Department noted in 2013 that he provides "religious guidance in support of [al-Qaida in the Arabian Peninsula] operations." Anwar al-Awlaki taught at Iman University in Sana'a, Yemen, an institution founded and run by Al-Zindani. Prosecutors in 2005 described Iman University as "a 'nest for terrorism' that exports and propagates terrorism." In the video Dhaouadi posted on Facebook, Al-Zindani thanked Qatar for supporting Al-Jazeera and for giving refuge to people who had been kicked out of their home countries – a likely reference to the terrorists harbored by the Gulf emirate. That might be appealing to Dhaouadi, who has issued extreme anti-Israel statements. After Saudi Arabia demanded that Qatar sever ties with Hamas last month, Dhaouadi accused the Saudis of "doing the bidding for the apartheid state of Israel. Selling out the Palestinian cause in the open." Palestinian attacks on Israelis, he has said, are not terrorist acts. "Resisting the occupation is NOT terrorism it is a legitimate right of defending one self from your land from real terrorists i.e. IDF," Dhaouadi wrote. Blumenthal has condemned Palestinian terrorist attacks against Israelis. Dhaouadi's support for the Boycott, Divestment, Sanctions (BDS) movement against Israel also stands at odds with Blumenthal's stated support for Israel. Blumenthal issued a Dec. 22 statement condemning a U.N. resolution calling Israel's West Bank settlements illegal. "Support for Israel on this issue has been and will continue to be strongly bipartisan. Consistent with past policy, this Administration must now veto this most recent misguided and one-sided attempt backed by the Palestinian Authority to isolate Israel and weaken the peace process," Blumenthal wrote. Blumenthal also strongly supports U.S. aid to the Israel Defense Forces (IDF), while Dhaouadi calls the IDF a "criminal force." "My name is Mongi Dhaouadi and I #SupportGaza because it is time we break-open Israel's concentration camps and end the occupation," Dhaouadi wrote in a July 2014 Facebook post. Blumenthal and Dhaouadi's public relationship dates to 2011 when the senator spoke at CAIR Connecticut's fundraising banquet. Dhaouadi was the chapter's executive director. Dhaouadi is not the only radical at CAIR Connecticut. In 2006, board member and chapter founder Badr Malik defended riots against the Danish cartoon of Islam's prophet Muhammad. "It's not an overreaction in my opinion. Because it's just like anti-Semitism is wrong, you don't put down a religion just because you are not of that religion. It's not supposed to be happening. Making fun of religion, making a joke of a prophet just to provoke people's emotion, it's not right. It's basically bashing a religion," Malik said. Fellow Connecticut board member Eman Beshtawii supports the Boycott, Divestment, Sanctions movement and rejects Israel's right to exist as a Jewish state. "If you support Israel's 'right to exist as a Jewish state' in a country whose indigenous Palestinian people today form half the population, then you ... must come to terms with the inevitability of massacres," Beshtawii wrote in a 2014 Facebook post. Blumenthal joined a rogue's gallery of Islamic extremists on the program at the 2011 banquet. That included Imam Siraj Wahhaj, who testified in defense of 1993 World Trade Center bombing mastermind Omar Abdel Rahman, and Ahmed Bedier, a former CAIR Tampa executive who described Israel as a "terror [state]." "I want to thank you for your friendship, for your support, for giving me the honor of being your United States senator; I am the United States senator for every single person in this room. I work for you," Blumenthal told the CAIR audience. He also attended Dhaouadi's April 2013 lecture on compassion in Islam and CAIR Connecticut's 9th annual banquet with Dhaouadi in December 2013. The banquet speaker's list also included Wahhaj and CAIR Florida Executive Director Hassan Shibly, a radical who defended Hizballah and opposes FBI sting operations. Last October, Blumenthal spoke at CAIR Connecticut's 13th annual banquet with radical Islamist Linda Sarsour. That month, Blumenthal also participated in a joint press conference with Dhaouadi and announced a plan to bring Syrian refugees into the U.S. quicker. 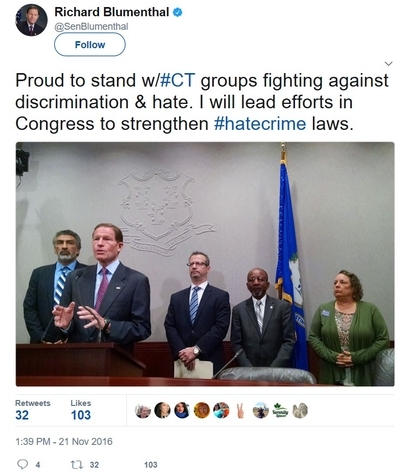 A month later, Blumenthal again stood with Dhaouadi and CAIR Connecticut at his state's capitol on Nov. 21 calling for stronger hate crimes laws. Dhaouadi, like other CAIR leaders, has a history of promoting hate crimes that turn out to be false. He labeled the brutal 2012 murder of Iraqi Muslim refugee Shaima Alawadi outside San Diego a hate crime. "She was found dead two weeks ago in her home, beaten, with a note sitting next to her that says, 'Go back home terrorist,' 'Go back home terrorist,'" Dhaouadi said. "I don't know about you, but I have two daughters who wear the head scarf and they walk down the streets and they attend the public schools in New London." Her husband was later convicted of the crime. 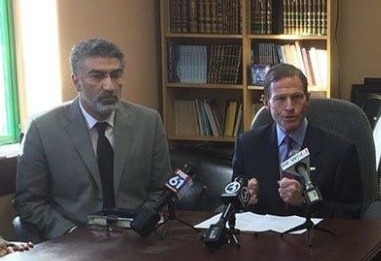 Several weeks after the hate crimes press conference, Blumenthal attended a forum on the subject at the Islamic Center of Connecticut in Windsor with Dhaouadi. During this CAIR-sponsored event, Blumenthal promised to "vigorously question" Attorney General nominee Jeff Sessions. Blumenthal held a joint press conference with Dhaouadi in February to protest President Trump's proposed travel ban. "We urge the president, abandon the Muslim ban. Abandon the religious test," Blumenthal said. Dhaouadi's recent pro-terrorist Facebook posts are only the tip of the iceberg when it comes to his terrorist sympathies. They wouldn't be terribly difficult for Blumenthal's staffers to discover. Dhaouadi also works for the Center for the Study of Islam and Democracy (CSID), a group linked to Tunisia's branch of the Muslim Brotherhood movement, the Ennahda Party. He supports Ennahda Party founder Rached Ghannouchi, a member of the International Muslim Brotherhood's Guidance Bureau. Dhaouadi's Facebook timeline includes numerous posts featuring images of Ghannouchi or news about the cleric. 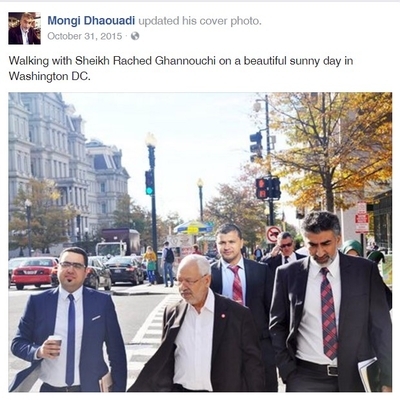 An October 2015 Facebook post shows Dhaouadi escorting Ghannouchi through the streets of Washington, D.C. Ghannouchi spoke three days earlier at an event in New York sponsored by CSID, founded by former Ennahda member Radwan Masmoudi. Dhaouadi also attended Ennahda's congress in Tunisia in May 2016. A Guantanamo Bay detainee report notes that Ennahda attempted to link up with other radical groups including al-Qaida during Ghannouchi's exile in the United Kingdom in the 1990s. More recently, Ghannouchi met in August 2011 with Ansar al-Shariah founder Seif Allah Ben Hassine, better known as Abu Iyadh – a former bin Laden ally sanctioned by the U.S. after 9/11. Abu Iyadh was responsible for al-Qaida's assassination of Northern Alliance leader Ahmed Shah Masood two days before the 9/11 attacks. Ghannouchi encouraged Tunisian Muslims to wage jihad in Syria against the Assad regime in 2014; Tunisians account for the largest contingent of foreign fighters in the country's civil war. Additionally, Ghannouchi's name appears in the phone book of Youssef Nada, founder of the Muslim Brotherhood controlled Al-Taqwa Bank, which U.S. Treasury officials described as an al-Qaida and Hamas funding source. Ghannouchi also maintains close ties with Hamas leaders such as Khaled Meshaal and has repeatedly called for Israel's destruction. He called for the "destruction of the Jews" at a December 1990 conference in Tehran at which he also called for jihad against America. Ghannouchi still supports terrorism against Israeli Jews; he gave a stirring endorsement of the Palestinian knife jihad, calling it a "historic opportunity to support this Intifada, support the Palestinians, and liberate Jerusalem" in a 2015 article published by Quds Press. Blumenthal castigated Attorney General Jeff Sessions for his association with Center for Security Policy founder, president and CEO Frank Gaffney and David Horowitz Freedom Center founder and CEO David Horowitz during Sessions' January confirmation hearing. Blumenthal wanted Sessions to disavow having called Horowitz "a man I admire." Blumenthal likewise asked Sessions to disavow the support that Gaffney and the Center for Security Policy gave him when they gave him an award in August 2015. "Senator Blumenthal ... has trouble distinguishing America's defenders from her enemies," Horowitz told the Investigative Project on Terrorism in an email. "He is so willfully blind, and so evidently under the influence of Muslim Brotherhood operatives that he is both evidently clueless about the threat they represent here in the United States, and he compounds it by castigating people who understand it far better than he does," Gaffney said. Blumenthal's office did not respond to requests for comment. His alliance with Dhaouadi is curious, given his grandstanding on Gaffney and Horowitz. If it's bad for Sessions to like people with controversial positions, why is it okay for Blumenthal?